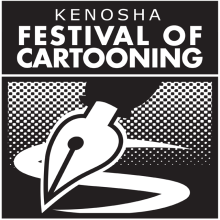 Although I have yet to actually attend, I've been a fan of the Kenosha Festival of Cartooning since just about Day One. In part because it is more of a festival than a convention, and in part because of its focus on comic strip creators instead of comic book creators. Certainly nothing against comic book creators -- I'm quite the fan as I'm sure you know -- but there are very few outlets to celebrate comic strip creators any more that I'm thrilled this one exists. Last week, they announced their 2016 guest speakers: Ann Telnaes, Jen Sorensen, Wiley Miller, John Hambrock, Rob Harrell, and Eddie Pittman. Seems like a good list of talent. One thing I find interesting is that the artists here all have very different types of careers, despite all being basically in cartooning. Of all these, Miller is, I believe, the only one who works exclusively on what most people would call a "regular" syndicated comic strip -- the others also do children's books, webcomics, storyboards, etc. But even then, Miller's Non-Sequitur is something of an odd duck, alternating between an ongoing narrative with defined characters and a modicum of continuity to one-note jokes that have no relation to whatever else has appeared in the strip. The diversity (in terms of careers) among the guests isn't new. Past guests include Jeff Keane, Tom Richmond, Lincoln Peirce, Denis Kitchen, Darrin Bell, Mark Anderson, and Bill Morrison. This year does seem to have a stronger influence from the web, though. Pittman ran his own webcomic for a while, and Sorensen's strips are likely seen more frequently online than in print. (I know I'm always a little surprised when I hear her strips are seen in papers.) Harrell seems pretty active on Twitter; Hambrock less so, but he's still on pretty regularly. What I think will be interesting is seeing those people who embrace (to varying degrees) the web as a promotional tool, or even a creative outlet, against someone like Miller, who's been actively dismissive of both in the past. Granted, his views may have softened or outright changed but his antagonistic relationship with webcomics, and Scott Kurtz in particular, goes back many years now. I'm really hoping to make it to the festival to hear some discussion (hopefully, intelligent and civil) around this point. I understand the Festival has been pretty successful so far, and shows no signs of slowing down. So it will be also interesting to see, as it continues, how the web continues to impact the guest lists. In five or ten years, how many creators won't have a webcomic going? Either as an adjunct to their syndicated strip, or using it as a first-run location with the strip showing up in newspapers via syndication afterwards? I think the lines between the two will continue to grey, which will hopefully not making things more challenging for the Festival itself!